Now that the Academy Of Motion Picture Arts And Sciences has deigned to give Leonardo DiCaprio an Oscar, it has apparently decided to stop screwing around with people’s emotions and give out awards to famous people who have put in a few decades of solid work. 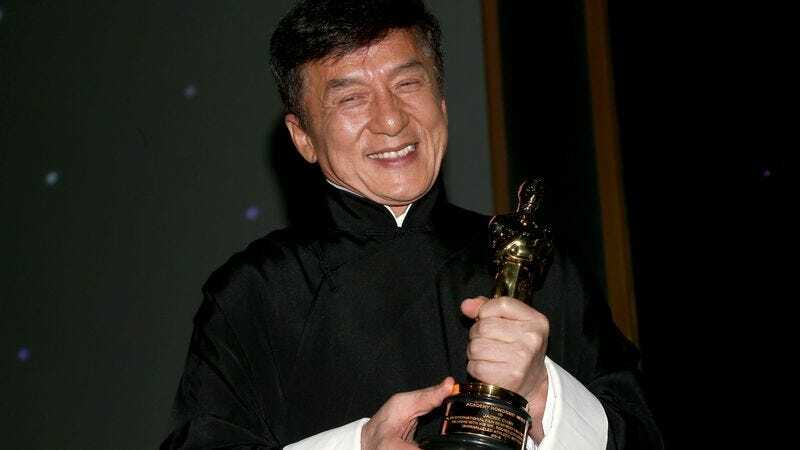 Jackie Chan became the latest beneficiary of this newfound generosity, with the Academy presenting him with an honorary Oscar at its annual Governors Awards ceremony over the weekend. Designed to honor the people who deserve Oscars but didn’t star in/direct/write/create the special effects for a big movie in the past year, the Governors Awards also saluted the contributions of some other people who didn’t star in The Tuxedo, including editor Anne V. Coates, casting director Lynn Stalmaster, and documentary filmmaker Frederick Wiseman.